Tax time is approaching and that means a juicy refund may be just around the corner. 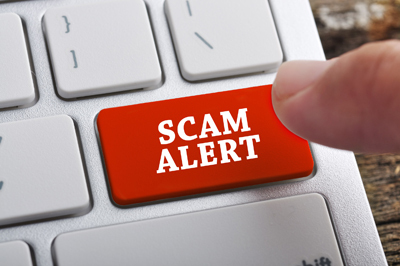 It’s a busy time for scammers too, and last year alone 48,000 Australians fell prey to tax scams between July and October. Already this year, the Tax Office has registered over 17,067 scam reports with victims collectively losing $1.5 million to fraudsters. That makes it worth knowing what to watch out for to keep your money safe this tax season. The tax man paid out $28 billion in tax refunds in 2016, which works out to an average refund of $1,500. With this sort of cash being handed over it’s not surprising scammers are trying to get their snouts in the trough. But it’s possible to outsmart the crooks by recognising the warning signs of a scam. First up, be wary of emails, phone calls and SMS claiming to come from the Tax Office. Be especially cautious if a caller ID pops up with a genuine Tax Office number. Scammers can easily get hold of these numbers from the Tax Office website but the catch is that outbound calls made by Tax Office staff don’t project numbers on caller ID. If you see one, it’s likely you’re being contacted by a scammer. One scam doing the rounds last year, which we can expect to see repeated in the months ahead, involved aggressive phone calls where the caller, claiming to be from the Tax Office, demanded payment of a tax debt and even threatened police action. The giveaway was that the scammers demanded payment by iTunes gift cards, and it doesn’t take much to work out the tax man doesn’t collect revenue this way. That said, none of us like to think we’re in trouble with the Tax Office, so some hapless victims paid up. Always bear in mind, the Tax Office doesn’t cold call. And if you owe money on tax you’re likely to receive plenty of notice in writing long before anyone contacts you by phone. Another scam involves emails or phone calls saying you’re owed a big tax refund - all you need to do is provide details of your bank account or make a payment via credit card to receive the refund. Like our banks, the Tax Office never requests details of your bank account this way, and it’s just silly to expect to pay to receive a tax refund. The best way to handle these emails or calls is to hit the ‘delete’ key or hang up. Have a chat to us if you'd like to find out more about about how to avoid scams, or if you’re unsure about whether a call, text message or email is genuine, or you think you’ve lost money to a tax scam, call the Tax Office on 1800 008 540. Chief Commentator for Money magazine.